So I got home after work tonight, and realised that I was out of fresh milk. So I decided to wander down to the corner shops to buy milk, and as I walked, I thought about cloud-based game designs. And during that walk, I think I finally broke through, and came up with a real game mechanic. It’s reasonably simple and easy to code, and I’m hoping to have a gameplay prototype worked out by tomorrow night. The screenshot here is just a quick rendering test, experimenting with cloud rendering. Of course, in the actual game, clouds will be a bit more rounded off than these rectangles; this was just a test of the basic concept. 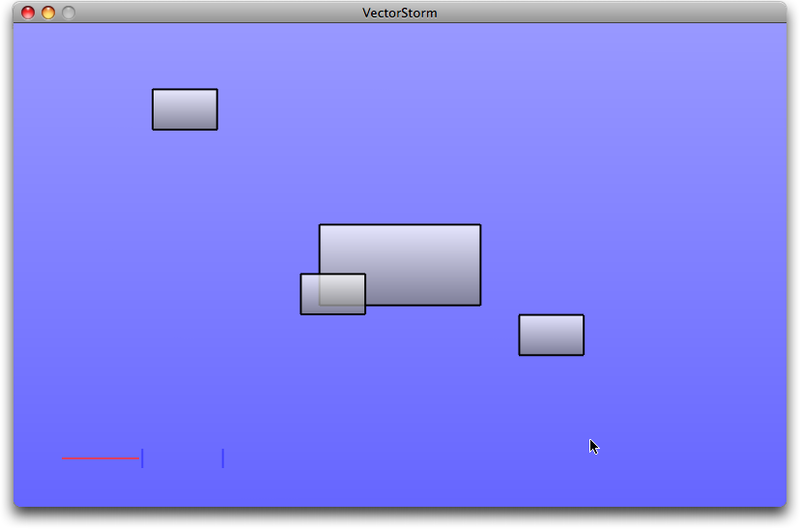 And yes, it’s rendering using ordinary VectorStorm rendering. It’s rendering normally instead of additively, and with the bloom shader turned off. And with an overlay for the sky, and for each cloud, to make the nice gradients. Hopefully I’ll have a much more representative screenshot to show off tomorrow! 21 February, 2008 in #3: ThunderStorm, Game in a Week.